Products Onion, Groundnuts, Cashew nuts ,RedChilli ,Rice ,Sesame Seeds, Jaggery Powder, Salt, Maize, Turmeric, Spices, Millets, Exporter, India, Chennai, South India. 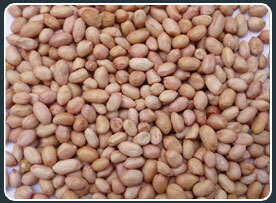 Groundnuts known it as Peanuts are a rich source of protein. Confectioners include salted Groundnuts and peanut butter which are also used in the commercial manufacture of candy and bakery products. Boiled peanuts or boiled in brine are typically eaten as a snack. Packing: 10/15/20/25/50 kgs new Jute bags or PP bags.